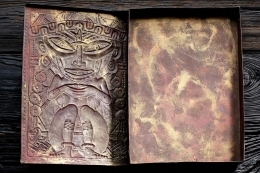 This rectangular box features an image of a witch doctor with hands folded as if preparing to preform a ceremony, rendered in low relief in iron and colored. 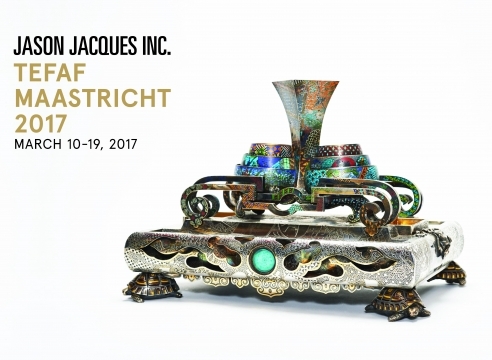 Alfred Daguet produced objects for Siegfried Bing, owner of the Paris emporium L’Art Nouveau. 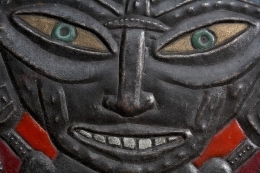 Repoussé, the technique in which a malleable metal is “pushed” with special tools from the reverse side to create a design, was employed to create the surface ornamentation. 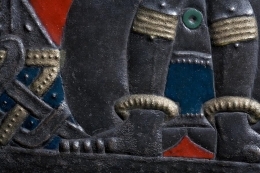 It was further refined by chasing, the process of sinking the metal from the front. Alfred Brocket is quoted in the book "The French Dinanderie" 1900-1950 Dominique and Marie Cecile Forest (page 159 editions of the amateur Paris 1995).